The untapped market for U.S. crude oil and natural gas isn’t across the sea in Asia or Europe, but just across the border in Mexico. More than 50 percent of Mexico’s energy imports now comes from the U.S. as Mexico’s national oil and gas company, Pemex, struggles to reinvest in its own production, according to a new report due out this week from S&P Global Platts that underscores the large stake Mexico has in buying fossil fuels from the United States. The country also has to move forward with a plan that began two years ago to restructure its energy markets and make them more competitive by attracting more participants from the U.S. and other countries. 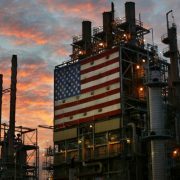 President Trump often touts America’s rapid growth as an oil and gas producer and exporter. The White House last week issued a statement touting new Energy Department data that showed the U.S. is on target to become a net natural gas exporter this year, meaning it will ship more of the fuel abroad than it imports. Mexico will play a role in that. To meet the demand for natural gas from the U.S., Mexican pipeline import capacity has risen by 145 percent in the last seven years, according to the report. Mexican officials in the U.S. recently pointed out that the increase in natural gas use is driven partly by environmental targets that demand it switch to cleaner-burning natural gas to meet its electricity demand. But Mexico is a bit of a novice in dealing with the complexities of operating a competitive natural gas market. It only just ramped up a new natural gas trading structure last month as part of its five-year market restructuring plan, according to S&P Global. Manufacturers and other industrial natural gas customers “have expressed concern about the recent lifting of natural gas price caps on first-hand sales and the possibility of price spikes in some regions,” according to the report. On the generation side, the cost of electricity has increased at a healthy pace compared to the lower prices in the United States, but that’s because the Mexican market has struggled to keep up with demand for the clean-burning fossil fuel. Power prices are climbing in Mexico as the natural gas market tightens, with prices rising 56 percent in the first half of the year, the report said. But those hiccups aren’t stopping U.S. energy companies from wanting to get into the Mexican market. Take ExxonMobil, for example. It “sees Mexico as an expanding market” where demand for fossil-based fuels is projected to grow more than 40 percent over the next 25 years, according to the report. At the same time, U.S. demand is expected to fall by 17 percent. The market for gasoline and diesel will be growing in Mexico, while the U.S. market is shrinking. Mexican imports of refined U.S. oil products such as gasoline experienced massive growth in the first quarter of 2017. That might be the reason why BP opened its first internationally branded retail gas station in Mexico City in May. It is the first of 1,500 new fuel stations that the oil company plans to build in the country. In contrast to the U.S., some large oil companies like Exxon have completely exited from the gas station business altogether over the last decade. Meanwhile, Mexico’s Pemex opened its first gas station in the United States about a year and a half ago in Houston. A Pemex official at the time said the station is meant to test the company’s ability to compete in the U.S. It plans to build a fleet of five stations in the Houston area.